Bolivia has long been the poorest country on the South American continent. And even though the economic situation has slightly improved recently, there has been little sign of any benefit for large sections of the population. All this applies equally to the city of Cochabamba, Bolivia‘s fourth-largest city. For although it has grown to become an industrial centre, nevertheless many of its inhabitants continue to live in deep poverty, and at the same time the continuing flight from the rural areas has led to more and more people flocking into the city. 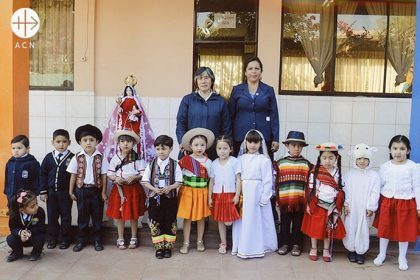 Sister Griselda with the children of the school “Nuestra Señora de Urkupiña”. 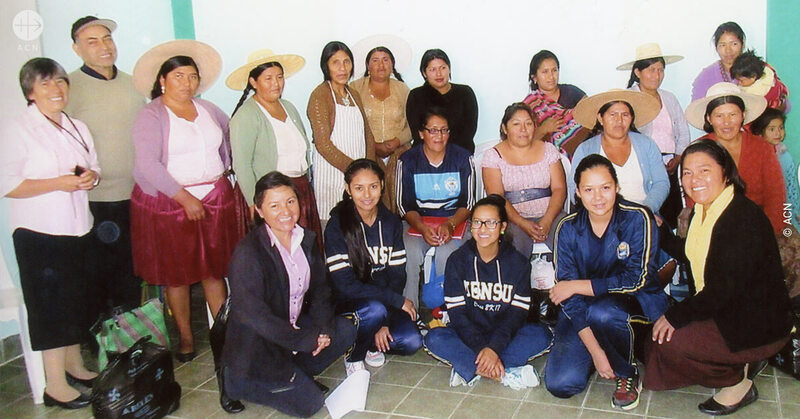 The Carmelite Sisters of the Most Sacred Heart have been working since 2005 in two parishes in Quillacollo, a western suburb of Cochabamba. Unlike the Discalced Carmelites, their better-known sister congregation, which is an enclosed, contemplative congregation founded by Saint Teresa of Avila, the Carmelites of the Sacred Heart are an active religious community. The five Carmelites in Cochabamba have opened up an educational centre for children, young people and women, where among other things they offer literacy courses and teach the women basic skills with which they can earn a living and support themselves and their families. They also prepare the children for their First Holy Communion, accompany the children, young people and adults on their path of faith, organise retreat days and – in an area where there are very few priests and the parishes very large – they play a vital role in spreading the Catholic faith. They also support and counsel women who are victims of domestic violence. The sisters have turned to ACN for support for their life and ministry, since by themselves they cannot make ends meet. They also have to find money for transport, medical provision and so forth, as well as for their own general upkeep. We have promised them 2,170 Euros.